THE ARTWOODS Art Gallery (Extremely rare fully autographed 1966 UK 12-track mono LP of dynamite R&B from the classic Mod band, featuring the talents of Arthur [Art] Wood on vocals, Derek Griffiths on guitar, Malcolm Pool on bass, Jon Lord on organ & Keef Hartley on drums, front laminated picture sleeve. This copy has been nicely autographed on the back in black biro by each band member! See 'More Info' for further details ... LK4830). 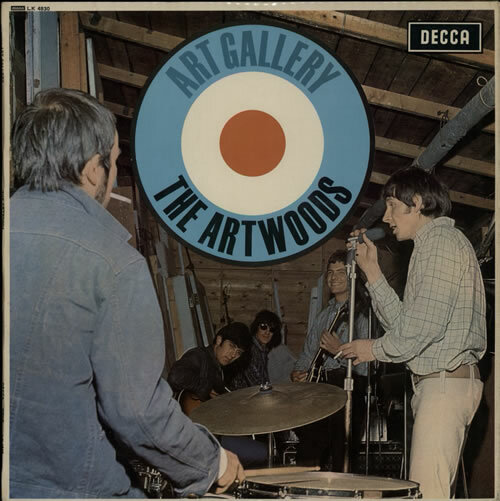 This is one of THE classic mod albums of the mid sixties. Easily up there with 'My Generation' as being one of the most partied LPs of 1965/66. As a consequence, these are seldom found mint. In truth, these are seldom found even intact, most having been written on, ripped covers etc. from their heady life spent going continously from party to party. This one does indeed have writing on the cover, but it's not your usual, run-of-the-mill, previous owner initials.......... We're talking a sleeve that has been FULLY AUTOGRAPHED on the back by each band member of the period & dedicated to a close fan circa '64-65. The signatures of Arthur 'Art' Wood, Derek Griffiths, Malcolm Pool, Jon Lord & Keef Hartley are all clear & present on the back cover in black biro. These were obtained by a close friend who met the Artwoods in 1964 & hung out with them for a couple of years, being a young influential lass of the sixties as she was. The group even performed in her home town in North Wales (Llandudno), where she received a fresh off the press first copy of this LP given to her by Art himself, which had the personal touch of bearing a full set of Artwoods autographs on! We have been told by its former owner, the sixties fan of the day, that the rear of the sleeve was shot in Malcolm Pool's back garden, as Malcolm's mother was a set designer with an array of spare props to hand. The autographed sleeve remains in exceptional condition, with no tears, all text legible & just the lightest spot of foxing to the unlaminated rear. What's nice about this item is that it comes with a spare unautographed sleeve too! This second example is clean & in solid, Excellent condition. The laminate on the spare sleeve actually stops much further over into the rear text, perhaps a printing mishap of the day? The labels are the classic red & silver unboxed design with deep groove both sides. The vinyl has been professionally cleaned & reaches an Excellent condition grade, easily the best we've ever stocked in fact. Visually, there are a few minor spindle marks by the centre hole to indicate play & just a few ever so faint paper scuffs that have no effect on play. This is quite simply a wonderful find, direct from a personal close friend of the group's from back in the day. Just try to find another one like this!